About now, your turf probably needs some extra nourishment to stay healthy. Fertilizer boosts your soil’s nutrients, ensuring your lawn has enough energy for the entire growing season. Fertilizer also reduces weeds, promotes new leaf and root growth, and helps your lawn recover from any pest damage or heavy foot traffic. Feed your hungry turf exactly what it needs by following these simple guidelines. Test your soil’s pH. Knowing your soil’s alkalinity or acidity, as well as its current nutrient levels, will help you determine which fertilizer to use. The potential to increase a soil’s acidity or alkalinity is usually printed on the fertilizer’s label. Soil pH should be as close to neutral – between 6.0 and 7.0 – as possible. Measure the square footage of your lawn along with soil pH levels to determine what kind and how much fertilizer to buy. Approximate how much fertilizer you’ll need. Most fertilizer labels will tell you how many square feet of coverage they contain. To determine how much fertilizer you’ll need, multiply the width of your lawn by its length. Subtract the square footage of areas, such as driveways, storage sheds, etc. 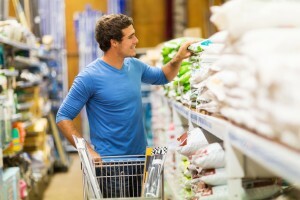 Try to buy only what you need because fertilizer doesn’t have a long shelf life. Understand the three numbers on the label. They represent the fertilizer’s three primary macronutrients in this order: nitrogen, phosphate and potassium. For example, a 20-5-10 bag will contain 20 percent nitrogen, 5 percent phosphate and 10 percent potassium. Fertilizer may also contain tiny amounts of other nutrients such as calcium, magnesium, iron, boron, copper, zinc and chloride. Nitrogen (N) supports leaf development and growth. Phosphorus (P) is essential for root growth. Potassium (K) also helps with root growth and stem development. It also increases turf’s resistance to disease and drought tolerance. Decide if you want quick-release or slow-release nitrogen. There are pros and cons to each. Quick-release nitrogen breaks down over two to four weeks. It becomes immediately available to your turf, quickly stimulating growth and greening. Just be careful: If it is over-applied, it can burn the grass blades. Slow-release nitrogen breaks down over six to eight weeks, depending on how often you water. This supports more uniform growth. It’s also less likely to burn. But the nutrients are not immediately available and they may not be as effective in cold soil. Determine when to apply. Apply your first feeding when your lawn begins actively growing, and based on the type of turf you have. Cool-season grasses: Fertilize lightly in the spring and more heavily in the fall. Time your fertilization schedule so your fertilizer will be used up before the grass goes dormant at the start of hot summer weather. Warm-season grasses: Fertilize as soon as the grass starts to turn green, because that’s the start of the growing season. Hold off fertilizing during the hottest summer months, and resume when the intense heat has subsided. Decide which kind of spreader works best for you. A drop spreader can be more precise while a broadcast spreader can cover more ground quickly. Broadcast spreaders are available in walk-behind as well as handheld models. Decide whether to use a drop spreader or a broadcast spreader. 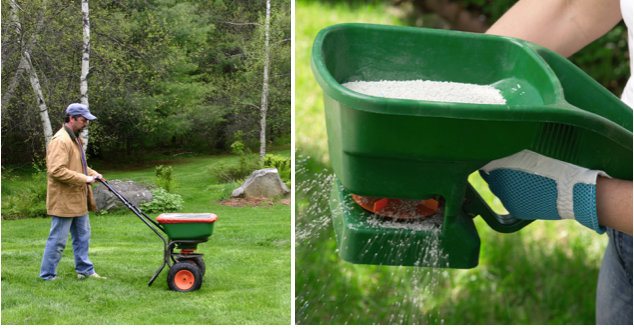 A drop spreader distributes fertilizer evenly through an opening at the bottom. A broadcast spreader (rotary spreader) drops fertilizer from the hopper into a spinning disc. While drop spreaders have less waste, it’s easy to miss areas. This may create stripes in your lawn. Most homeowners opt for broadcast spreaders. Go around the perimeter of your lawn first. Then fill in the middle. Apply as evenly as possible. For complete coverage, apply half of the fertilizer while going one direction, then go perpendicular with the second half of the application. Read the label for complete instructions. Some fertilizers require that you water the lawn before or after application. Always wear a dust mask, safety goggles and rubber boots when applying fertilizer. Cover your arms and legs by wearing long pants and a long-sleeved shirt. Keep pets and people off the grass for about a day. And be kind to the environment. Sweep up any granules that land on your driveway, sidewalk or patio. Allowing it to wash away the next time it rains can pollute your local water supply. I was wondering what you would recommend for a push broadcast spreader. I have a half acre and want a good professional product. Hi Dan, A broadcast spreader is best for larger areas. It will take you less time and give you an even balance of fertilizer across your lawn. There are many brands to choose from, we would suggest Scotts brand broadcast spreaders for small to medium sized lawns; 1/4 acre to 1/2 acre.